"Storyteller John Reitmeier is an attraction in himself!" Soon we'll be webcasting the audio portion of each show live over the internet so that folks can listen when they're away from home. When we're back from Europe we'll have the webcam up and running in our main studio (named Studio "B" LONG BEFORE Shep on the Fox network started his program!) so our listeners can become viewers on many of the days. 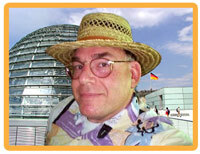 Just what is John Reitmeier's Cool Site - Pick of the Day ? Since 1977 John has done just about everything there is to do in radio. Evening country disc Jockey, Mid-day country disc jockey, weekend fill in talk show host and equipment engineer at KDWN in Las Vegas, Midnight talk show host on KDWN in Las Vegas (creating West Coast AM which went on to be renamed Coast to Coast AM when John left and a certain Art Bell was hired), Program Director, Class C FM station owner, and since 1997, the morning "sparkle" added to radio stations with John Reitmeier's Cool Site - Pick of the Day program. No network feed here! John is live on the air with each station's morning talent. Always topical, a little bit crazy, but for SURE something that STOPS listeners actions for just a moment to TUNE IN to see what John's talking about this morning! Broadcasting from a wide variety of locations, some dangerous, some silly, some fun, and some very serious, John brings the listener facts, information, and an interesting MOMENT in their daily routine! Available for your radio market, John is also available to speak to any age group. He can make a presentation to young people about their future and their responsibility living in America. He's great with college students and talking about focus and FUN in life. Need to motivate your sales or marketing staff? Need a new idea to get a client off TOP DEAD CENTER? Let John be the catalyst. Always a team player, John leans heavily on his network of partners from around the world. Is your church group in the doldrums? John can lead your group back to a no apologies--Christian Action Group! In our team are members from all walks of life and LOTS OF TALENT including winners of 2 ProMax awards for Best Film Promo (my voice is on one of them). Please contact us for more information...let's become partners!